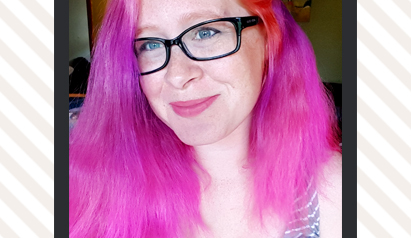 I’m Trish, MommaTrish, and I have been a Sugarbabe at Sweet Shoppe since May of 2013 and have been digital scrapbooking since the fall of 2007. I have spent years honing my style and finding the perfect balance of memory keeping, beauty, and me to put into my pages. 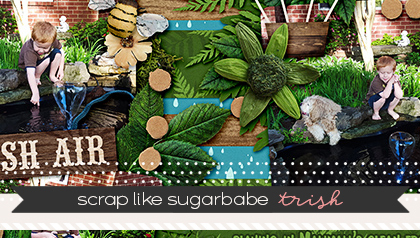 I love creating big, messy clusters and simple designs on crazy backgrounds. I also like to try to incorporate my own artwork and other creative outlets into my pages as well. My claim to fame would probably have to be my messy, busyness of my pages. The thing that I hear most about my pages is that, when looking at them, people are unsure of where I begin or how I go about putting my pages together. 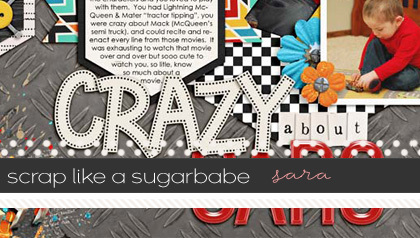 On my last Scrap Like a Sugarbabe post I went over this using a very large photo artsy type page. Since it is still what I hear the most often I figured that I would go over the same thing, but with a much more traditional (for me) style page using multiple photos. Here is a video, a little under 10 minutes long, walking you through me making my scrapbook page. 1) Using the rectangle marquee to create paper strips. I really prefer using the rectangle marquee to create my paper strips. When I do them I first put a new blank layer over my paper and the use the marquee to create my strips. To create multiple strips on one layer simply make your first strip and then hold control (CTRL) down as you continue making more. Then use your paint fill, make sure the blank layer is selected and then click in one of the strips. This will fill in all of the selected areas with that color. When it comes to papers (or other flat objects) that lay flat against your background subtle is better when it comes to shadows. One of the easiest ways to create that subtle shadow is to open your layer style panel and change your shadow color. Use the color picker and select the color of what is under your paper. If it seems to subtle or too light simple go for a slightly darker version of the color. 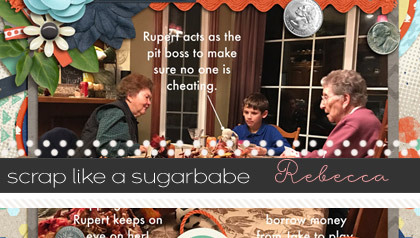 For this page I used the rounded rectangle shape tool to create the shape to clip my photos into. 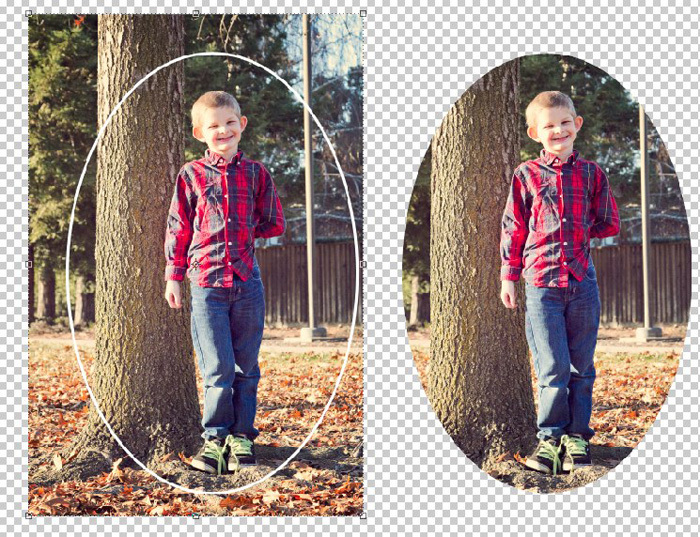 If you know that you plan to be using the same size shape for multiple things newer versions of Photoshop have a very easy way to create them. Simply create your first shape and then click on your work area and a dialogue box to create that shape again using the exact same dimensions that you just used. A great way to create visual flow through your page is by using an implied triangle. This doesn’t mean that everything on your page has to be done in one or more giant triangles. Instead what you can do is create implied triangles by repeating certain elements and placing them in key places on your page. 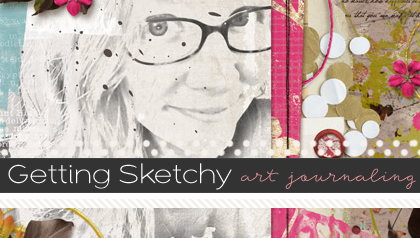 5) Adding subtle journaling to a busy background. Sometimes you need to journal on your pages but you don’t want to add any journaling cards or strips. An easy way to add it, and have it readable, is to take a slightly bold font, type your journaling and then change your font color to a lighter color on the area where you are journaling. Then open your layer styles and a 5-10 point outside stroke to your text in a darker color from your background. This works really well on backgrounds that have 2-3 very defined colors or shades of a color. Save time by cutting out your digital embellishments using your Silhouette!